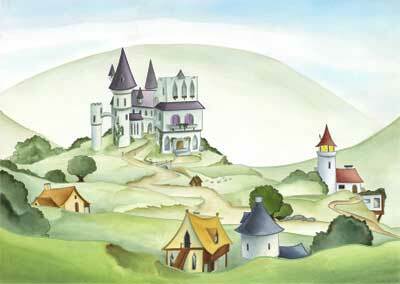 Landscape illustration for the Princess Samantha book: The Return of Knockturnia book. This illustration was created to show an overview of the kingdom of Knockturnia, and is one of the first illustrations shown in the book. As with the other illustrations in the book, the illustrations were first worked out in pencil, and then coloured. After the illustration is fully coloured, we scan the illustration in, and in this instance we created the line work on computer, using Adobe Illustrator. In other projects, we can choose to do the line work free hand, using a rotering pen or brush. This can give the illustration a more natural, if less clean look.